The question of identity can be a slippery one, and all the more so when culture is introduced into the equation. Culture complicates identity because culture -- all culture -- is inherently fascist in nature. How could it be otherwise? Its primary purpose is the maintenance of the "us/them" dichotomy, with the policing of Us for social orthodoxy and the segregation of Them for social deviance. Individual identity, then, must necessarily come into conflict with culture since, in many respects, one grows at the expense of the other. To the extent that you've become an individual, you've almost necessarily broken from some cultural othodoxy or other. This argument weights individuality over culture, of course, and the other side of the coin should also be considered: For if culture can be seen as the policing of its adherants, it can also be seen as the passing on of received wisdom from one generation to the next, and not all such wisdom is a reactionary set of social shackles. How to distinguish the positive and negative elements of culture, when defining one's self as a human being? Many never bother to ask, and become what their culture tells them to become; others rebel by casting all cultural restraints aside, but this can be as reactionary a choice as the former, and just as damaging. For the rest of us, the quest for individuality becomes a weighing of cultural expectations against personal experience. As balancing acts go, it's a tricky one. 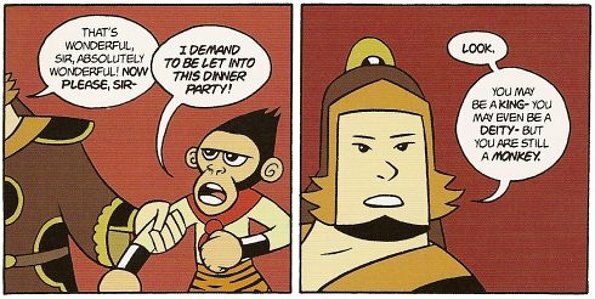 Here's one thing you probably don't want to say to the Monkey King. Sequence from American Born Chinese, ©2006 Gene Yang. It's a conflict that sits at the heart of Gene Luen Yang's thought-provoking graphic novel, American Born Chinese, and the strategies that Yang has chosen to address it are clever, creative and ultimately fairly satisfying, though it raises as many questions as it answers. The novel's narrative unfolds by way of three seemingly separate tracks. We begin with a retelling of the old Chinese story of the Monkey King, who represents the individual rebellion against culture: The Monkey King, slighted by the gods at a party in Heaven, responds by slaughtering the lot of them, then trains and grows in order to surmount future such challenges. In the process, however, he also picks up a few of the gods' assumptions and accepts them unquestioningly, as symbolized by his edict that from this point forward, all monkeys shall wear shoes, in the manner of human beings. Jin contemplates the wisdom of his elders. Sequence from American Born Chinese, ©2006 Gene Yang. Here Yang shifts tracks, and introduced us to Jin, a modern, second-generation Asian-American child, growing up seemingly assimilated into American culture. As time passes, however, he begins to chafe at the expectations and assumptions of the world around him, irritated at having to explain that he was born in America and that his family doesn't eat dogs, bristling at racist slurs from some of the surrounding Caucasian children in school. Having set all this up, Yang then introduces a third narrative track, this time depicting the tortures inflicted upon a white teenager named Danny as he endures a visit from his ambiguously defined cousin, an outrageous collection of extreme racist stereotypes named Chin-Kee, complete with buck teeth, oversized glasses and his own sitcom-style laugh track. As if his very appearance (velly apeallance?) wasn't far enough over the top, Yang proceeds to crank up the volume on Chin-Kee's obnoxious one-dimensionality throughout the book, with simultaneously hilarious and cringe-inducing results. I-i-i-it's Chin-Kee! 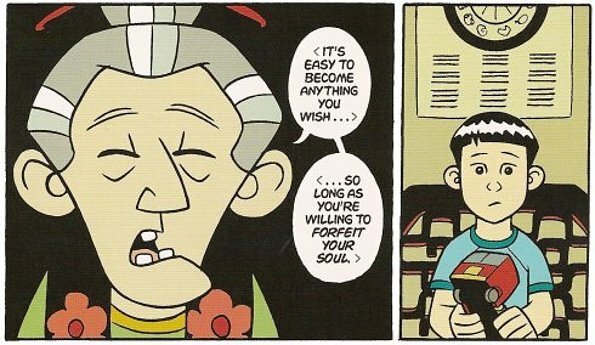 Panel from American Born Chinese, ©2006 Gene Yang. From this point on, American Born Chinese leaps effortlessly from track to track, allowing each narrative to serve as counterpoint to the others, eventually blending elements from each story until the end, where all three storylines confront one another and search for a resolution. It's a deft and ambitious performance, and the result is a skillfully told exploration of cultural identity in a land not necessarily constructed with its protagonist in mind. The art is clean and fluid, capable of turning from comedy to introspection on a dime without giving the reader whiplash in the process. The narrative is equally accomplished, building themes and subtext through plot development and symbolism. Caucasian-dominant American culture is presented as having both positive and negative elements, the former best symbolized by the girl of his dreams, Amelia, a nice and accepting person who slips through Jin's fingers because of his own insecurities rather than any fault on her part. Yang's too good a graphic novelist to resort to easy outs or exposition to get his point across, and his storytelling strategies convey more nuance and food for thought than would be possible if he simply sat down and tried to lecture you on the complexities of growing up from an Asian-American perspective. His artful creativity produces a subtle and carefully constructed world, and that's no small feat. That said, I found American Born Chinese to contain more unanswered questions than appear at first glance. Towards the end of the story, the Monkey King tells his fellow protagonist, "You know, Jin, I would've saved myself from five hundred years' imprisonment beneath a mountain of rock had I only realized how good it is to be a monkey." It's a seemingly simple, direct bit of received wisdom, but ultimately, it's as much an invitation to allow heritage to trump personal experience as Chin-Kee represents a smothering, humiliating denial of personal identity by the racist sensibilities of outsiders: In either direction lies a repudiation of the self in favor of group assumptions of one sort or another. As story's end, there's an implied turn away from the surrounding culture towards ethnic heritage, as though it were an either/or choice. In real life, however, things usually aren't that simple, and both sides of the presented dichotomy contain their own unique drawbacks. Does one really have to choose? Is there no middle ground between the two? In American Born Chinese, Gene Yang presents a tale of reconciliation to one's traditional culture, but also leaves the vague impression of a rejection of the surrounding culture as well, or at least a preferential ranking of the two. Us trumps Them, and that isn't necessarily a satisfactory conclusion, when you think about it. 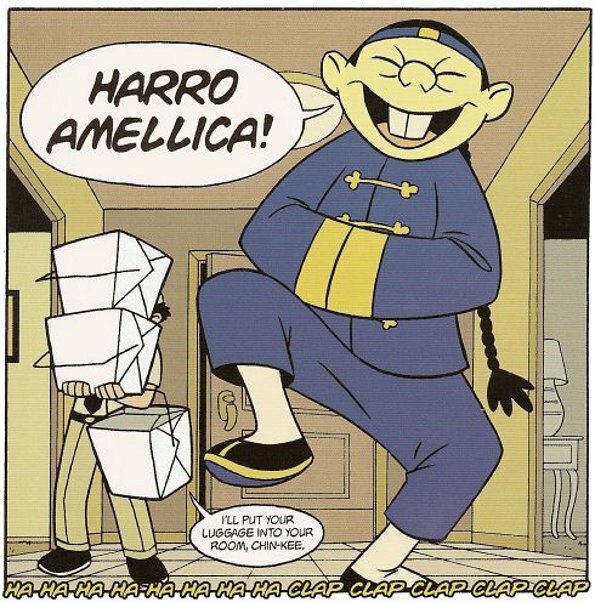 American Born Chinese is an impressive and engaging debut, to be sure, and I highly recommend that you read it, but I'd hate to think that it's the last word on the subject.